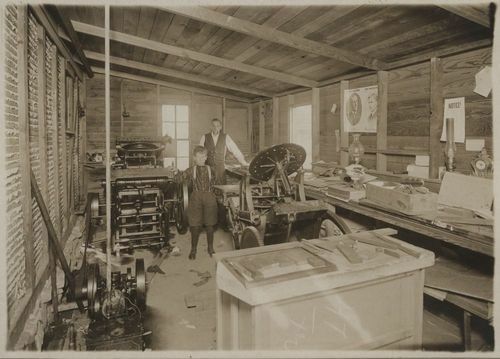 This sepia colored photograph shows an unidentified gentleman and a young Merl Longley inside a print shop at Salem, Kansas. To the left of Longley, is a Chandler & Price printing press. A poster of Woodrow Wilson for President and Thomas R. Marshall for Vice-President is hanging from the wall on the right.